Finally Rochelle Intermodal will get a proper yard! 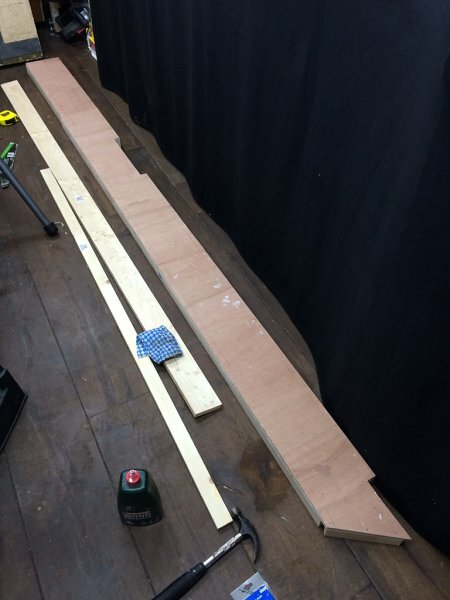 I’ve just completed the woodwork for the new yard board – this board is about 10ft long and will hang off the wall behind and slightly above the intermodal yard. It will be easily accessible, but will not be used to move cars on and off the layout, only for staging and making up trains. There will be a separate track in front of the proposed motive power yard for taking cars on and off to prevent having to reach over and make it easier to rail the cars. 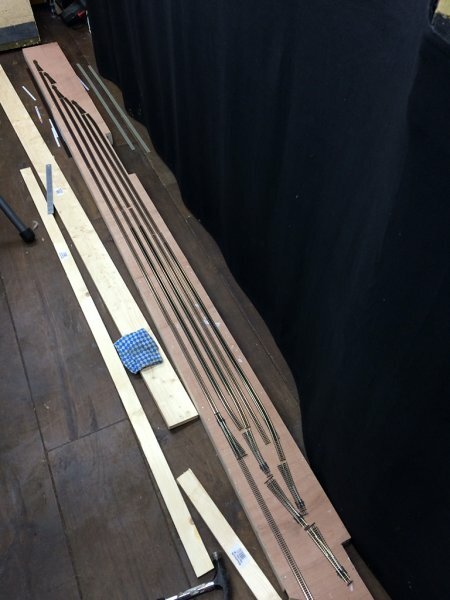 Here is the completed board – all one piece as it will be hinged to allow access to the underneath for maintenance purposes. I’ll be adding the trackwork, wiring, point motors and electrical circuitry before attaching the board to the wall to make it easier for myself to work on! I’ve test-laid the trackwork to make sure I can fit in as many tracks as possible in the narrow width available, using compound yard ladder trackwork – the A/D track will be far left, and bottom right of the photo is the yard lead, which will split into two to allow access to the track for putting rolling stock onto the layout and for a dedicated track into the motive power yard. Depending on space, I might have a smaller yard next to the motive power yard as well. I’m hoping to start the track-laying this coming weekend, if I have time to paint the woodwork first (for moisture control). The control panel for this yard will be mounted on the fascia in front of the intermodal yard (using a CML DTM30 TowerMaster board) and will also be available via Railroad & Co’s +SmartHand Mobile app on any mobile devices being used to control the layout.